This is a very tasty dish. It can be an accompaniment to any meat or fish or with a little extra cheese such as cheddar for vegetarians. One advantage is you don’t have to make a sauce as the cream gives a delicious moistness. You will need an ovenproof dish of approx 1½ pints / 900ml capacity. Grease the dish, heat the oven to gas 4 180C. Slice the leek, heat the oil in a frying pan and cook the leek gently on a low heat until soft but not browning (about 10-15 mins). Remove from the heat. Chop the tomatoes and stir in with the garlic, chopped parsley, salt and pepper. Very thinly slice the potatoes and arrange half the slices in the dish, spread with the leek mixture and top with the remaining potatoes. Combine the cream and milk, pour over the potatoes and sprinkle with the cheese and paprika. 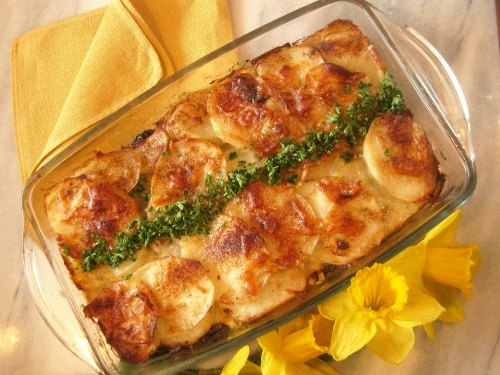 Bake for approximately 1 hour or until the potatoes are tender. NOTE: The paprika not only adds flavour but also colour.